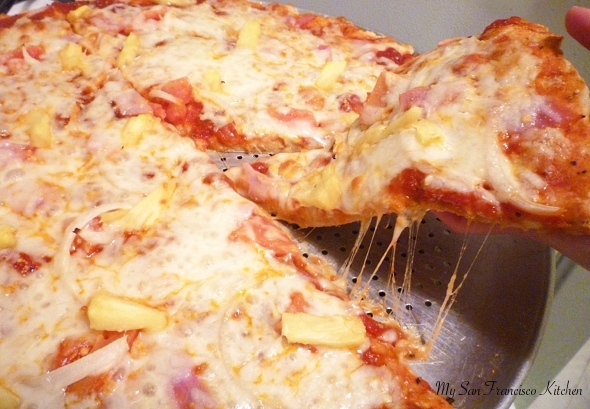 This whole wheat, homemade Hawaiian pizza is made from scratch with whole wheat flour, a touch of olive oil, chunky tomato sauce, onions (not traditional, but I am an onion lover), fresh pineapple chunks, healthy ham from Trader Joes, and mozzarella cheese. In a large bowl, add yeast, sugar, and warm water. Let stand 7 minutes. Add salt, olive oil and 1 cup of flour and stir with a fork. Add remaining flour in portions, stirring in between. Knead dough with floured hands on a floured surface for 10 minutes. Place back in bowl and cover with a damp towel. Let rest for 45 minutes. Punch down and let rest 30 minutes. Preheat oven to 435 ºF. Roll dough as thin as desired on a floured surface, and carefully transfer to a greased pizza pan. Quickly pour a small amount of olive oil over dough, and spread around with hands or brush to cover with a very thin coat. Pour pizza sauce (sometimes I used pasta sauce and add oregano and basil) over dough and spread with a spoon. Bake for 20 minutes at 435 ºF. Check at 15 minutes for browning. Crust should be very firm, and the cheese should just START to brown a little. This entry was posted in Dinner, Italian, Lunch and tagged ham, mozzarella cheese, onions, pineapple, pizza, tomato, whole wheat flour.